Royal Chain has released a new gold collection and they are straight to the point about who itâ€™s made for, targeting the Instagram and â€œselfie obsessedâ€� Millennials and Gen Z audience. Royal Chain calls the new series, â€œThe Influencer Collectionâ€�, having fun with the younger generationsâ€™ mentality that they are all â€œinfluencers,â€� even if they can be seen as the main targets of this new collection. 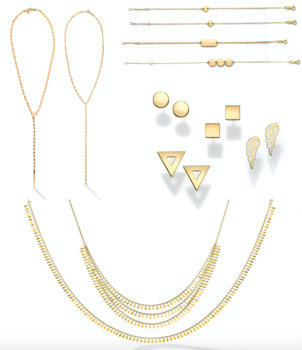 The 52 piece assortment features all 14K gold items with opening price points, starting as low as $85. The designs include fun novelty pieces and splurge-worthy trending fashions designed with a next-gen vibe. The collectionâ€™s accompanying brochure shows the collection in a minimalistic way, alongside nostalgic Polaroid shots and all-important trending hashtags. Royal Chain plans to introduce more in this series in the summer during Las Vegas Jewelry week and other sub-sequent shows. The Influencer Collection is now available and can be ordered by visiting Royal Chainâ€™s website or calling 800.622.0960. Retailers can also visit them at JCK Las Vegas, in their new home at the Sands Expo, Booth 7109.